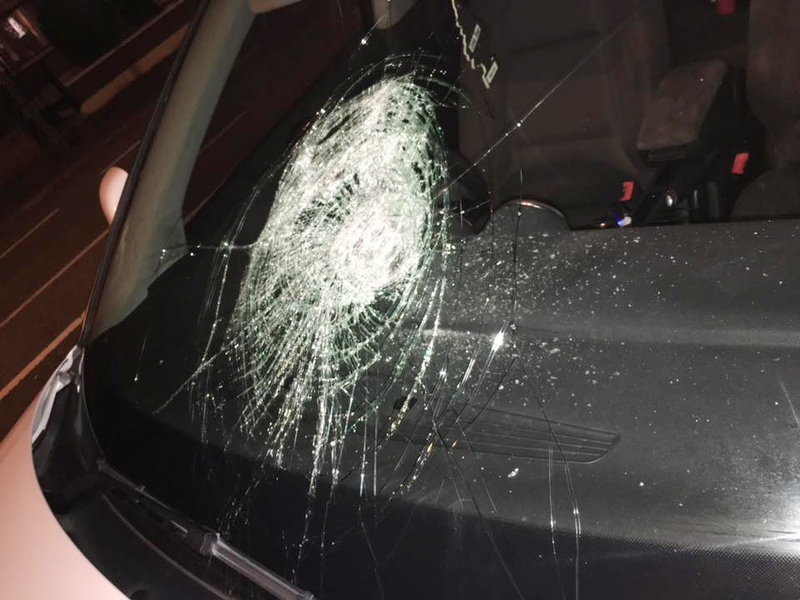 A NORTH Belfast woman is urging other road users to be vigilant after her car was attacked by youths in the Oldpark at the weekend. Charlene McAdams was driving along the Oldpark Road when her car windscreen was smashed by a rock thrown by kids in Marrowbone Park. “I went for a bite to eat with my partner and I was driving up the Oldpark Road when I heard a massive crash,” Charlene explained. “I couldn’t really open my eyes because there was so much glass in them. I managed to pull the car over and realised my windscreen was smashed. “I got out of the car and saw a massive rock lying on the road and hundreds of kids in the park. A group of them ran away as soon as I pulled the car in. Charlene is urging parents to be more aware of where their kids are and is also urging other road users to be vigilant in the Oldpark area. “I think realistically parents need to know where they are and they need to know what they are doing. “Unfortunately other cars were also attacked with rocks and bricks, so I would urge other road users to be extremely careful around that area. “I’m slightly relieved it happened to me instead of an elderly person or someone with kids in the car as God knows what the outcome could have been. Charlene would also like to thank a local man for his kind gesture after he paid to replace the windscreen of her car. “I couldn’t believe it when I found out about his kind gesture. I can’t thank him enough. The car attack is just the latest in an area which has been plagued by anti-social behaviour in recent months. Local SDLP Councillor Paul McCusker said such reckless behaviour needs to stop. “Those responsible can’t be allowed to ruin the good image of the community on the Oldpark and need to stop this reckless behaviour now,” he said. “I will continue to be on the ground over the coming weeks and months with youth workers who were very helpful last night in dealing with the young people. “We need everyone on board including parents to deal with this before someone is seriously hurt or killed. “This behaviour is unacceptable and will not be tolerated,” he added.